Yurts: Living in the Round journeys from Central Asia to modern America and reveals the history, evolution, and contemporary benefits of yurt living. Kemery introduces the innovators who redesigned the yurt and took it from back country trekking and campground uses to modern permanent homes and offices. Yurts also offers advice on every aspect of setting up modern fabric yurts-from foundations and heating to building codes, bear proofing, and interior design. 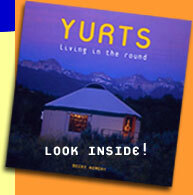 Photographs throughout book rouse your imagination, and the extensive resource section gives you the information you need to take the first step toward realizing your own yurt dreams. Want to know what it is like to live in a yurt? Then Becky Kemery’s delightfully-illustrated and well-researched book is for you. Author Becky Kemery shares her personal experiences of yurt living as well as practical considerations she has learned from others. She gives suggestions on choosing, buying, setting up, insuring, and maintaining a fabric yurt. A complete resource guide offers information on yurt companies, financing, plans, as well as homesteading and sustainable living. The definitive source of information about anything to do with yurts. I heartily recommend this book to anyone interested in simple, sustainable living, enduring vernacular architecture, or the possibilities inherent in living in the round. Becky Kemery has always been a pioneer and this book is an answer to a question that will be asked more and more over the next years–how to live simply, affordably, in tune with ourselves, each other, and the earth. 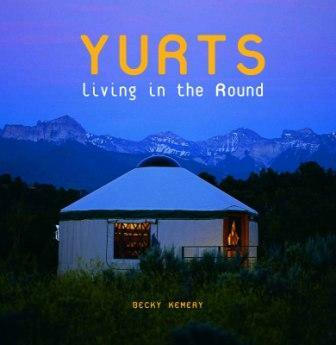 Becky Kemery’s Yurts: Living in the Round is to books what a home run with three players on base is to baseball! It couldn’t be better than this! Becky’s book is full of practical information that’s written in a clear and concise prose. It’s packed with beautiful photographs and is graced by delightful stories of people who have made their next home a yurt. I highly recommend this book to anyone who’s pondering ways to live more sustainably on this precious Earth. Great resource book for anyone wanting to buy a yurt or live in a yurt. Gives a great deal of practical information on purchasing a yurt, deck building, plumbing, bear proofing and making a yurt a comfortable home.A must-buy for anyone wanting a yurt. An excellent choice for any lending collection strong on alternative home-building options. The blend of color photos and lively yet practical ‘how to’ advice’ is unique. I would recommend this book as an addition to any library collection. It is an inspiring book. A valuable resource for everyone from do-it-yourselfers to those who want to contract a distinctive round home, it also includes a philosophical and aesthetic contemplation of the purposes of shelter and the attraction of roundness.